The Delta Group of Companies is a privately owned, versatile, integrated group of companies specializing in execution of complex infrastructure projects in the Power, Industrial, Infrastructure and Renewable Energy Sectors in India and abroad. The Delta Group's core competencies are Design Engineering; Project Management & Turnkey Construction; Logistics Handling, Management & Consultancy services and project specific is written essays Procurement services. The Delta Group has also entered into collaborations with leading OEM manufacturers worldwide and exclusively Represent these companies and promote their cutting-edge technologies, products and services. The strength of The Delta Group lies in its ability to effectively support and complement its activities across various business segments. We are the pioneers of "One Point Responsibility" concept in India and encourage leading EPC contractors and Project Developers to avail of multiple services offered under the umbrella of The Delta Group, as a customized single point solution rather than several separate services. Over the past 30 years, it has been our privilege to be the preferred partner for some of the world's most reputed companies for their projects in India and abroad. We endeavor to continue specializing, innovating, expanding and diversifying our services to meet the demands of the industries we serve as well as the demands of our clients and build on our hard earned reputation for quality and dedication towards excellence. Reliability, efficiency and professionalism are qualities incorporated in the basic DNA of The Delta Group and we hope that we can be your reliable partner in the developing core sector. VisionaRE Power aims to provide environmentally friendly, cost effective and time bound power solutions for consumers, industries and society as a whole. Incorporated in 1993, Delta Mechcons India Limited is an Engineering and Construction Company involved in Engineering Construction of Power plants, Petrochemicals and Refineries in India having executed several prestigious projects for various leading Indian and foreign multinationals. 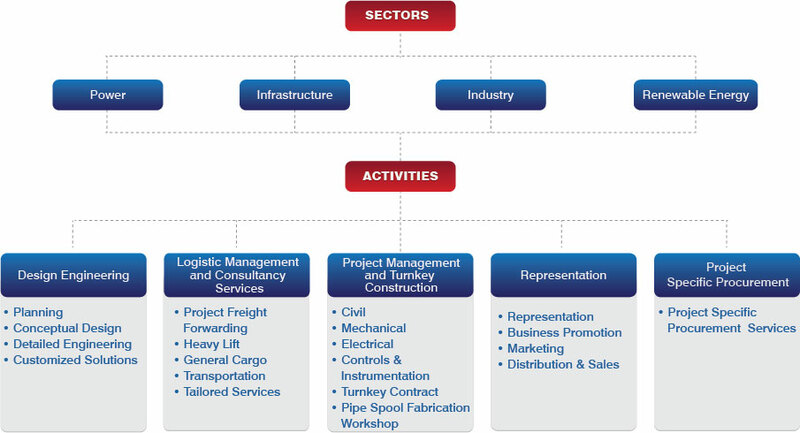 The major activities of the Organisation covers various disciplines of engineering from basic engineering & conceptual study to completion of project including Manufacturing, Supply, Construction and Commissioning. The services and end product of DELTA MECHCONS accepted by various customers are backed with state of art Technology and are found of the highest standards developed over a period of time, backed by both in terms of Equipment and Experienced Personnel. The state of art technology with norms of International standards and Codes, DELTA MECHCONS (INDIA) LIMITED is geared to meet any challenges, and targets of any project, thereby fulfilling the requirements of customers to their satisfaction. As of date Organisation is a framework of Reliability, Efficiency and professional output, which can meet any challenges in the industry. DELTA GENCONS (INDIA) PVT. LTD. is focusing on undertaking turnkey projects by combining their services of Civil , Mechanical & Electricals under one project for implementing the project work on time bound manner. Since these services are available to the clients as combined package as well as individual service our clients will be free to select either one to complete their project on schedule and with the cost control. The Logistic Handling expertise available with DELTA GENCON will also supplement the turnkey concept offered by the Company. Sea Hawk Cargo Carriers Pvt. Ltd.
SEA HAWK CARGO CARRIERS PVT. LTD. is engaged broadly in Shipping, Road Transportation, Air Transportation, Clearing and Forwarding, Supply, Leasing Agency Representation and Construction. Divisions of Sea Hawk include Heavy Cargo Movement Consultation, Project Freight Forwarding, Litherage Services, Equipment Supply, Management and Control and Client's Material Control. SEA HAWK has firmly established itself in areas of operations by adjusting, specializing, expanding and diversifying its services to meet the demands of the industry and of its clients. SEA HAWK has consciously developed, with flexibility, the image of an international forwarding group without any diminution of the close personal attention afforded. To provide a truly global service, we have also developed a good working relationship with a number of associates and correspondents world vide whose assistance and facilities complement those of SEA HAWK. The services of SEA HAWK are available as separate entities – as a select combination or as a total package – and it is a source of satisfaction to us that we are able to tailor our services to suit the precise requirements of each individual client. Reliability, Efficiency and Professionalism are qualities incorporated into one frame which is what SEA HAWK'S basic tenet is – and shall remain. By leveraging our strength and rich experience in construction of large conventional power projects, we have launched VisionaRE Power Pvt. Ltd. whose main business activity is to provide Engineering Procurement Construction (EPC) services for Solar Projects in India as a logical expansion of The Delta Group's main activities. VisionaRE Power Pvt. Ltd. main business activity will be Power Generation from Renewable and Non-Conventional Sources of Energy, as we firmly believe that this is the future of the Power Sector in India and across the globe. We intend to provide environmentally friendly power solutions via different technologies including Solar Power, Waste to Energy, Biomass based Power, Wind Power, Tidal Power etc.